One of Drink Local Wine’s great regrets was that we were never able to do Michigan wine. The state had some of the best regional wine in the country, and its efforts have only improved since then. I know this because I was lucky enough to get Michigan wine samples last fall, and the quality was consistent and impressive. 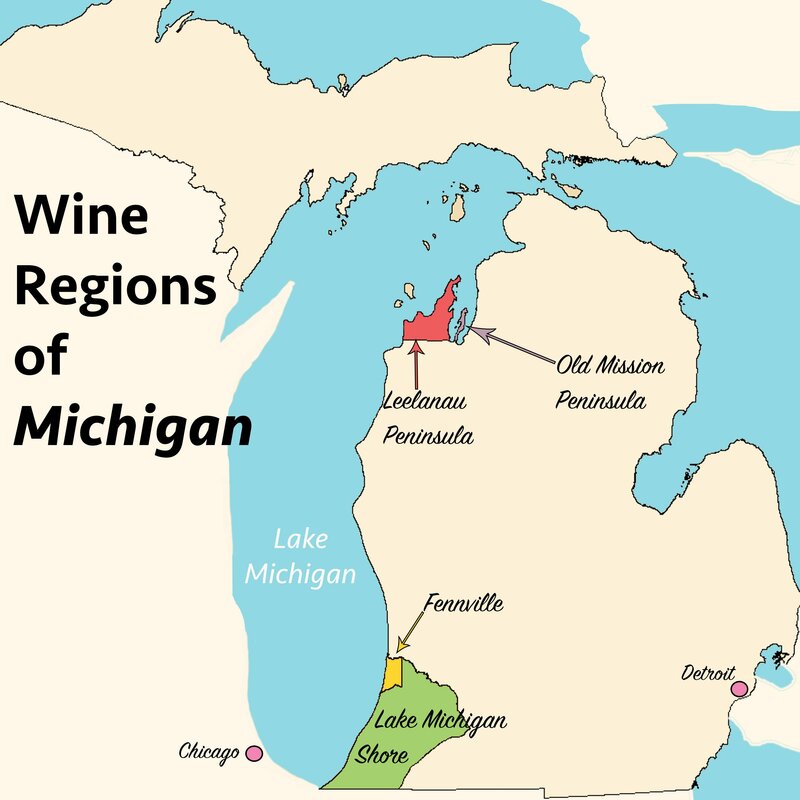 Wine is made throughout the state, but the best known region is along the northwestern Lake Michigan shore, centered around Traverse City. That means weather is a challenge every year, and cold, snow, and ice have wreaked havoc with any number of vintages. Riesling is its trademark grape, but some cold climate reds are also outstanding. The following wines were the best I tasted – all were samples. Availability may be limited in other parts of the country. 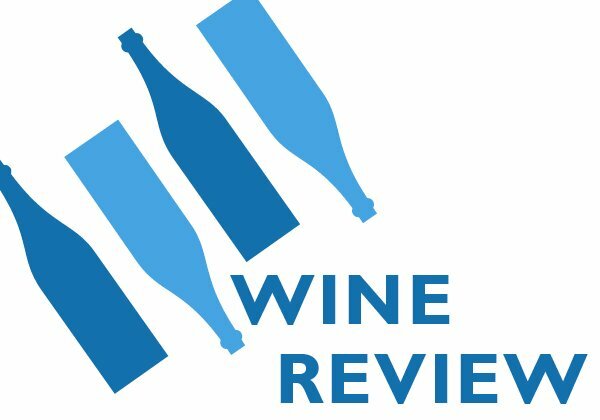 • Chateau Grand Traverse Dry Resling 2017 ($14, 12%): One of regional wine’s biggest challenges is producing affordable products, but this long-time Michigan producer has done just that. It’s a little tight, but reflects Michigan’s style and terror — almost stone fruit instead of citrus; a crisp, steely finish; and an appealing and pleasing riesling softness. Highly recommended. • Mari Vineyards Gamay Noir 2017 ($26, 13%): This red is a trifle pricey, but impeccably made and just as delicious. Again, a terroir-driven wine that is less fruity (tart cherry, perhaps?) and more noticeably spicy than a Beaujolais from France, which is also made with gamay. This vintage is sold out, but if the 2018 is anything close to the 2017, it’s a must buy. • 2 Lads Cabernet Franc 2016 ($35, 13.5%): This is an intriguing approach to cabernet franc, a red grape that does well in many regional states and is best known as the red from the Loire in France. It doesn’t have the pencil lead that marks some Loire wines, and it’s not as fruity as a west coast label. Instead, it features blackberry fruit and baking spice, plus an almost zesty mouth feel. It’s well made and top quality, but the price is a problem. • Chateau Chantal Proprietor’s Reserve Trio 2016 ($27, 13.5%): Excellent example of what Michigan can do with a red blend. It’s brisk and spicy with well-developed berry fruit. There’s an appealingly lean structure, save for a bit of ashy heaviness on the back and a touch too much oak. • Hawthorne Vineyards Rose 2016 ($12, 13.2%): A dry pink wine that is heavier than I prefer, but still well made and rose-like — dark raspberry and strawberry fruit. And, again, an affordable price. • Peninsula Cellars Late Harvest Riesling 2016 ($19, 8.5%): This white dessert wine is just so close to being the kind that wins double gold medals and best in shows. It’s sweet – think honey and ripe peaches – balanced by an almost fresh orange juice acidity. That’s where it falls just a smidge short, since a little more acidity would balance the sweetness. But it’s still a delicious wine and well worth the price. Real German riesling – the kind with all those indecipherable words on the label, like the Dönnhoff Norheimer Kirschheck Riesling Spätlese – is known for four things. First, as a wine geek favorite; second, for amazing quality; third, as almost unknown to anyone who isn’t a wine geek; and fourth, as not easy to find. • Spatlese is one of many German term describing sweetness – it means sweet, but not a dessert wine. In this case, noticeable, but not overpowering. • Donnhoff is the producer, a 200-year-old family operation that is among the best in Germany. The importer works with the renowned Terry Theise, whose taste in German riesling is impeccable. • Norheimer Kirschheck, in Nahe, is the vineyard. Nahe, in western Germany near the French border, is the appellation and famous for its soils. What does this mean for the wine? It’s less traditional than many other spatleses, but still firmly within the category. There is a little honeyed sweetness, the amazing petrol aroma with a hint of mint, a slate-like minerality, and the high-quality lemon fruit that holds everything together. The best part is that the wine is still quite young, and will change appreciably as it gets older, becoming richer and more luxurious. Highly recommended, and just the thing for Thanksgiving. Serve this chilled, but not so cold that you can’t taste all the flavors. And open it 45 minutes or so before serving. Thanksgiving is the blog’s favorite holiday, and might be the greatest wine holiday in the world. That’s because families and friends get to share lots of wine, and because Thanksgiving isn’t about money, showing off, or big-screen plasma TVs. Instead, it’s about being thankful that we can be together to enjoy the holiday. 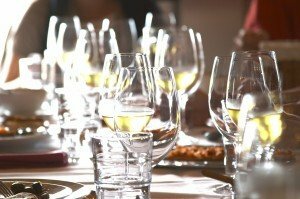 The blog’s guidelines for holiday wine buying are here. • Ken Forrester Petit Rose 2017 ($10, purchased, 13%): Always well made pink wine from a South African producer with impeccable taste (the chenin blanc is worth buying, too). It’s a blend of grenache and a little viognier, so there is less fruit (unripe strawberry?) than expected and more stoniness and minerality. Highly recommended. Imported by USA Wine Imports. • Wakefield Promised Land Riesling 2016 ($12, sample, 12,5%): This is just what a cheap Aussie riesling should be — and what we don’t get enough of in this country, where riesling is about sweetness for sweetness’ sake. Look for lemon-lime fruit, a little petrol aroma and a surprisingly full mouth feel, some sparkle, and hint of sweetness. Highly recommended. Imported by Seaview Imports. • Masi Campofiorin Rosso del Veronese 2014 ($17, sample, 13%): If all $17 wine had this much character and interest, then I wouldn’t be complaining about $17 wine. Rich, concentrated red corvina fruit, plus Italian earthiness and not too much acidity. Balanced and very nicely done; an ideal turkey wine. Imported by Kobrand. • Naveran Cava Brut 2015 ($15, purchased, 12%): Maybe one of the best cavas in the world, and certainly one of the best sparkling wines given the price. A knockout, even with the usual high quality of cava — lots of crispness, plenty of tight bubbles, and some sweetish apple fruit. In this, it is a fuller, richer wine than the $10 bottles that I usually drink. Imported by Ole Imports. 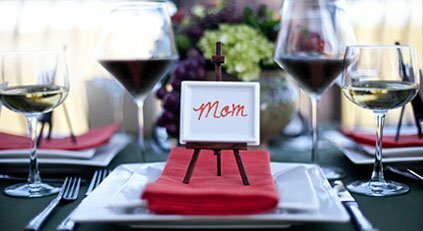 The same lesson applies for this, the Wine Curmudgeon’s 11th annual Mother’s Day wine post, that applied to the previous 10. 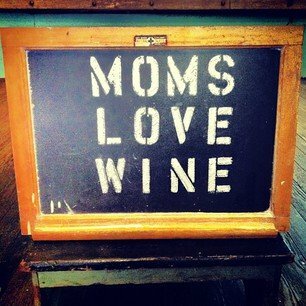 Buy Mom something she will like, and not something you think she should drink. 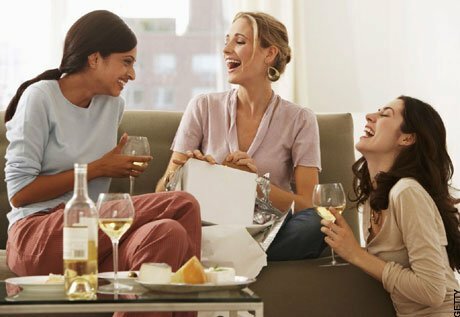 Our Mother’s Day wine gift giving guidelines are here; the idea is to make her happy, not to impress her with your wine knowledge. She’s your Mom – she’s impressed already. • Pewsey Vale Dry Riesling 2015 ($16, sample, 12.5%): Australian rieslings are some of the least known quality wines in the world, because who associates riesling and Australia? This white shows why the wines offer so much quality at more than a fair price: dry, crisp, lemon and lime fruit, and a certain zestiness. Highly recommended. • Cristalino Rose Brut NV ($9, sample, 12%): Every time I taste this Spanish cava, or sparkling wine, I am amazed at how well made it is, and especially how well made it is for the price. No wonder it has been in the $10 Hall of Fame since the beginning. Tight bubbles, red and citrus fruit, and perfect for Mother’s Day brunch. • Mulderbosch Cabernet Sauvignon Rose 2016 ($10, sample, 12.5%): This South African pink is tighter and more closed this year, and the weight of the cabernet is more obvious. Having said that, it’s still a fine, fresh rose, with dark red fruit and a little spice and what could even be tannins in the back that add a little interest. • Bravium Pinot Noir 2015 ($30, sample, 12.5%): This California red is nicely done, a varietally correct pinot from the well-regarded Anderson Valley and more or less worth what it costs. Some earth, red fruit and even a hint of orange peel. Wow, the Wine Curmudgeon is right. These wines are worth the extra money. Premiumization and premiumized wine gets a nasty rap on the blog, and why not? Who wants to pay $15 for wine that’s worth half of that? But the Wine Curmudgeon is nothing if not open minded, which is one of the keys to quality criticism. • Chateau d’Epire Savennieres 2014 ($22, purchased, 13%): I love Savennieres, chenin blanc from France’s Loire Valley, but quality Savennieres isn’t $10 anymore and even the pricey stuff is difficult to find or overpriced. But the d’Epire was everything I hoped it would be – fresh lemon fruit instead of the Sweet Tart style you find in so many less well made wines, plus the traditional steely minerality. Highly recommended, even for $22. It should age a little, too, showing less fruit and more minerality as it gets older. • Donati Family Vineyards Claret 2013 ($20, sample, 13.8%): This California red blend was an astounding value, full of quality red fruit (cherry and strawberry?) and an almost Italian-style freshness. Yes, grilled sausages and red sauce, but also a long dinner with good conversation. I was a little surprised by how much I enjoyed it, and not just for the value; it’s that so many other California wines at this price taste like fruit punch spiked with alcohol. • Domaine de la Chanteleuserie Cuvée Alouettes ($17, purchased, 12%): This red from France’s Loire (made with cabernet franc) is not for everyone, and especially if you prefer a New World, fruit forward style. But if you want to try an impeccably made wine, with berry fruit, a little graphite and spice, and wonderful length, give it a try. Highly recommended, and just the thing for steak frites. • St. Urbans-Hof Alte Reben Riesling 2015 ($18, sample, 10.5%): Quality German riesling, like Savennieres, has been mostly priced out of what most of us are willing to pay for wine. That’s what made the Alte Reben so enjoyable – it’s more or less worth what it costs. Look for a slightly honeyish sweetness with riesling’s telltale petrol aroma and bright lemon acidity. Very tasty, and just the thing as spring arrives. 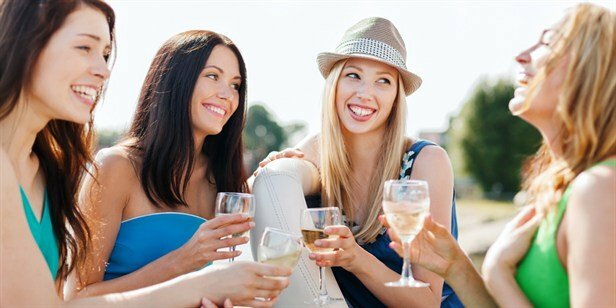 Has the hot weather made you as cranky as the WC tasting 15 percent chardonnay? 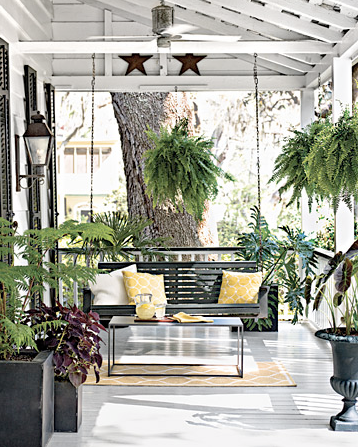 Then take a long, cool sip of the porch wine post. We haven’t hit 100 in Dallas yet, but 99 for the last week or so is close enough. And, from what I hear from my pals in the rest of the country, it’s too damn hot where they are. Which means it’s time for a porch wine post – focusing on lighter wines, red and white, that are lower in alcohol and that offer relief from the heat. The idea with a porch wine is to drink something that won’t make the sweat bead on your forehead. • Nik. Weis Urban Riesling 2015 ($15, sample, 9%): Well-made German riesling is difficult to find in Dallas, which makes no sense given how warm-weather friendly the wine is. The Weis is made in a more modern style, with fresher apricot fruit instead of dried and brighter acidity, but it’s also layered with the traditional honey notes. Nicely done, and will even age a little. • El Coto Rosado 2015 ($9, purchased, 13.5%): The El Coto is is one of my favorite Spanish roses, and if it’s not quite as well done as the Muga, it’s still delicious and a tremendous value. Look for strawberry fruit, plus a little earthiness and even orange peel from the tempranillo that’s in the blend. • Torresella Prosecco Extra Dry NV ($15, sample, 11.5%): This Italian sparkler reminded me why I love wine. I much prefer cava to Prosecco, so it’s always a pleasure to find a Prosecco worth writing about – not too sweet, firm bubbles, surprisingly balanced, and more apple and pear fruit than most others. Highly recommended. • Drouhin Domaine des Hospices de Belleville Fleurie 2014 ($25, sample, 13%): Top-notch red from the French region of Beaujolais that has nothing in common with most of the plonk made there these days. Firm but not overbearing, with red fruit and soft tannins, and something you can drink on its own or with food. The only drawback is the cost, but given how expensive this quality of French wine has become, it’s not overpriced. Reviews of wines that don ?t need their own post, but are worth noting for one reason or another. Look for it on the final Friday of each month. ?Reinhold Haart Riesling 2014 ($35, sample, 7%): Gorgeous, honeyed white wine with sweet lemon fruit — and not the fake Sweet Tart kind common these days — that reminds you how wonderful German riesling can be. This is sweet wine the way it should be, made to be a sweet riesling instead of just being made to be sweet. ?Piccini Memoro Rosso 2014 ($12, sample, 14%): Very ordinary Italian red blend of no particular interest, with that ashy middle that often shows up when too much winemaking is going on. The poorly done oak overshadows too soft red fruit. ?Domaine des Cadastres Picpoul 2014 ($10, sample, 13%): Regular visitors know how much the Wine Curmudgeon appreciates picpoul, a cheap French white. Sadly, this isn’t one of them. Old-fashioned, but not in a good way, made with unripe grapes, almost no fruit flavor, and a too sour taste.
? Tenuta Sant’Antonio Corvina 2013 ($10, purchased 13%): One review of this Italian red made with the corvina grape (usually used as for blending) says it has tropical fruit, an interesting way to describe a red wine. Another way is flabby and soft, without any freshness or acidity. Very disappointing given the quality of the producer.